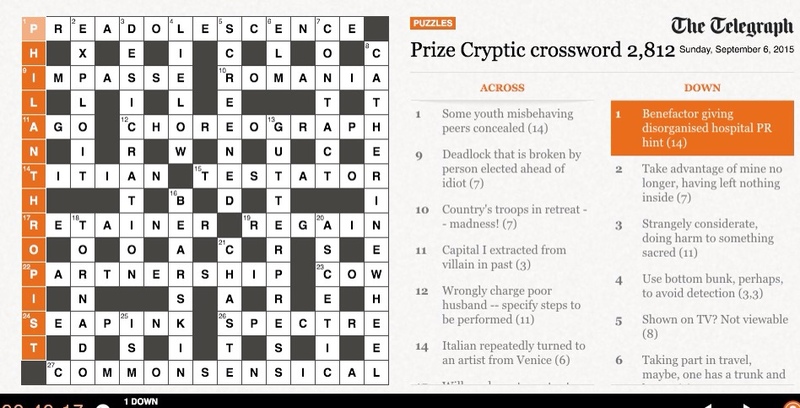 I have been doing the Saturday and Sunday Telegraph crosswords for fifteen years; or, thirty five years, with a twenty year break. I learnt how to solve the Daily Telegraph crossword during sixth form maths lessons (I was in a class of four, all of whom were doing double maths: we finished the single maths syllabus in a term or so, and then our enlightened teacher taught us how to solve crosswords, one of his loves, and bridge, another; teaching bridge by also teaching us A level statistics, which we weren't being examined on. But JLT's (our teacher's initials) inspirational teaching us statistics was a boon to my future university studies and career). 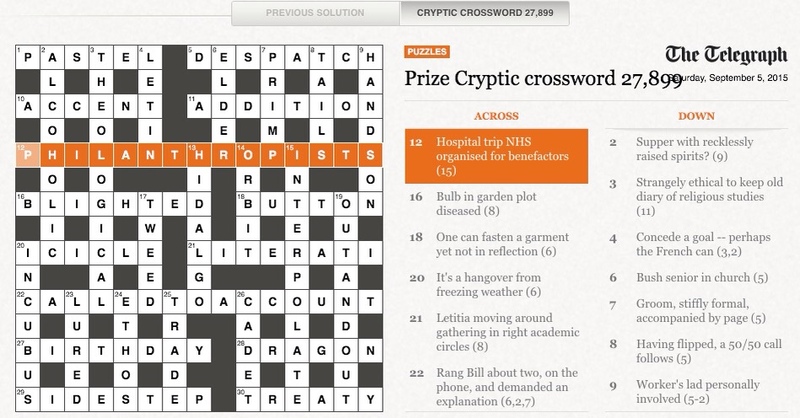 I used to practice crossword solving in 'free periods'. Eventually, I used to solve them in five minutes or so. Ten would be appalling, five acceptable. But then I got bored with them, stopped, and gave them no further thought until we moved to where we now live, and a couple who became really close friends re-introduced me, it being their joint pastime. I like crosswords less now, and can take them or leave them, and now only do the weekend ones. As such, since so much is habit, my solving times have doubled, trebled or worse. This Sunday's was one clue easier than it needed to be. The setters change each day, so the consecutive appeared of PHILANTHROPISTS must be a coincidence, and I suspect an extremely rare one at that. I wonder how many similar occurrences there have been over the years, both in general and also with 14 letter words. Surely not many of the latter?